HCM City (VNA) – A patrol team of An Suong traffic police of Ho Chi Minh City uncovered the illegal transportation of 895 cakes of heroin (equivalent to around 315 kg) on the night of March 27. The heroin was found in five cartons on the van with plate 20C-166.23 when it was stopped by the patrol team for checking on highway 22. Two people on the car were arrested and they confessed that they were on way to deliver the drugs in Hoc Mon district. According to Deputy Director of the Ho Chi Minh City Police Le Anh Minh, each cake of heroin weighs over 350 grammes and the 895 cakes have a total weight of 315 kg. 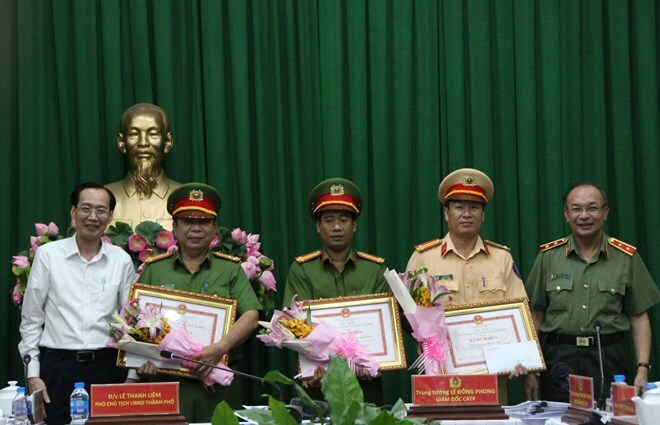 Investigations have found the involvement of four Taiwanese people who hired a storehouse in Tan Binh ward, Di An commune, southern Binh Duong province and the heroin likely coming from the golden triangle.